Since I was a little girl I have been spoiled. My mother has always bought boneless chicken. I grew up thinking that was the norm and turning my nose up at anything that required me to eat around something that was slimy, hard, and inedible. When I moved up to San Francisco, I too bought boneless chicken breasts and nobody challenged me on it. Until Matt. With his love of hot wings and getting messy with food in general I did my best to resist, but I knew that in the end I would eventually succumb to the bone. His argument? The bone adds flavor. The bone gives you something to hold on to. And chicken wings are fun to deep fry. I couldn’t. But I did say yes with a fight. I am particular about sauce and with how the meat is fundamentally cooked. I prefer deep fried then doused in sauce and then baked to make ’em crispy again. This method has taken months to perfect. Which brings me to the main star of the subject. 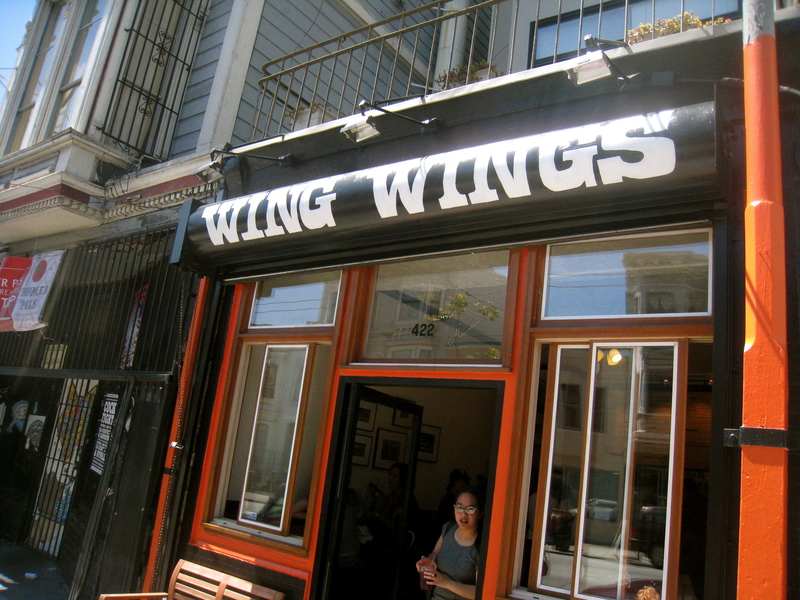 Wing Wings the new restaurant in Lower Haight opened today, June 15th. I went, I saw, I sort of conquered. Upon entering Matt and I were greeted by the girl at the cashier and the cool breeze from the open windows and ceiling fan. There was music playing loud, a wall full of Old Bay, and an employee giving a full blown description of every sauce to the man next to me. Based on first impressions, Wing Wings got it right. 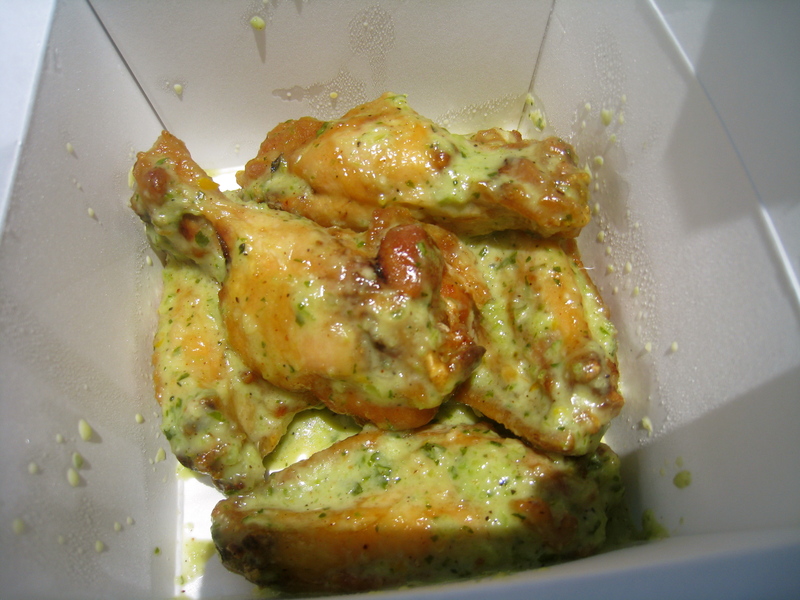 By nature chicken wings are not sophisticated or formal and they are not clean. Wing Wings gets that. There were no tables or cloth napkins or waiters. Just some bar stools along counters on both walls, homemade looking sauce in containers, and lots of napkin dispensers. Simple and uncomplicated. Now, don’t confuse uncomplicated with uninteresting. With 8 different sauces and 6 options for sides (not including the biscuits) Matt and I couldn’t try everything but let me tell you, I wanted to. They offer the classic flavors like Buffalo (reg or hot), BBQ, and Wing Wing (their house special) but I was most interested in a few of their unique options – namely Angry Korean, Jerk, and Orange Miso. 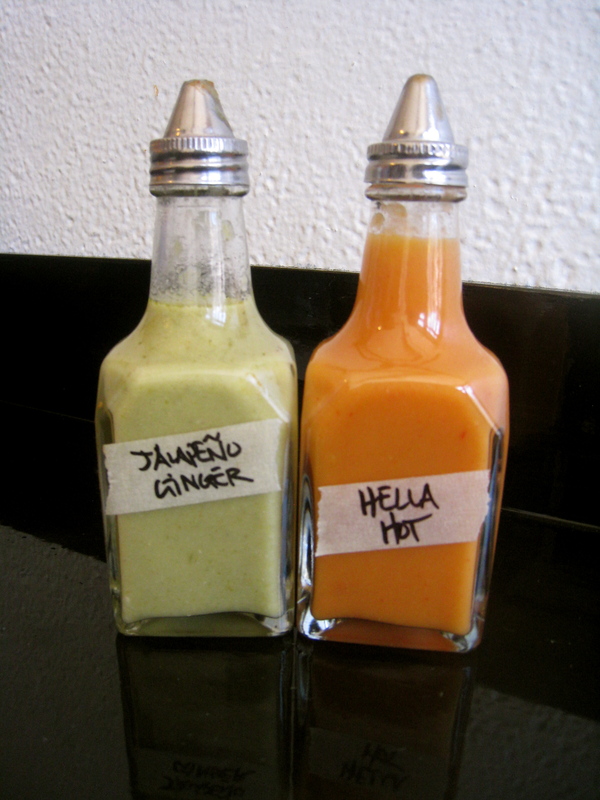 After contemplating a little while Matt and I decided on the first two, leaving Orange Miso to be tried another day. We noticed the Ad-Ons underneath featured fresh chilies and OMG bacon, but we refrained for today since we wanted to focus on the flavor profiles of the wings themselves. I was pleasantly surprised to find out that the chicken comes from Pitman Family Farms meaning that its all free range, air chilled and not frozen. And believe it or not endorsed by PETA. Seriously, how the hell do you get PETA to endorse the way an animal is killed? Kudos for sure on that one. Even with using above average chicken, Wing Wings prices are still cheaper than most restaurants that feature wings. $6 for 5, $10 for 10, and $23 for 25. I looked at the board listing the sides featuring the usual: Potato Salad, Macaroni Salad, Coleslaw and Fried Plantains. Then I looked at Matt and came to the agreement that while the fried plantains intrigued me the most I had just made us some a few days ago. Macaroni and Coleslaw made the cut. 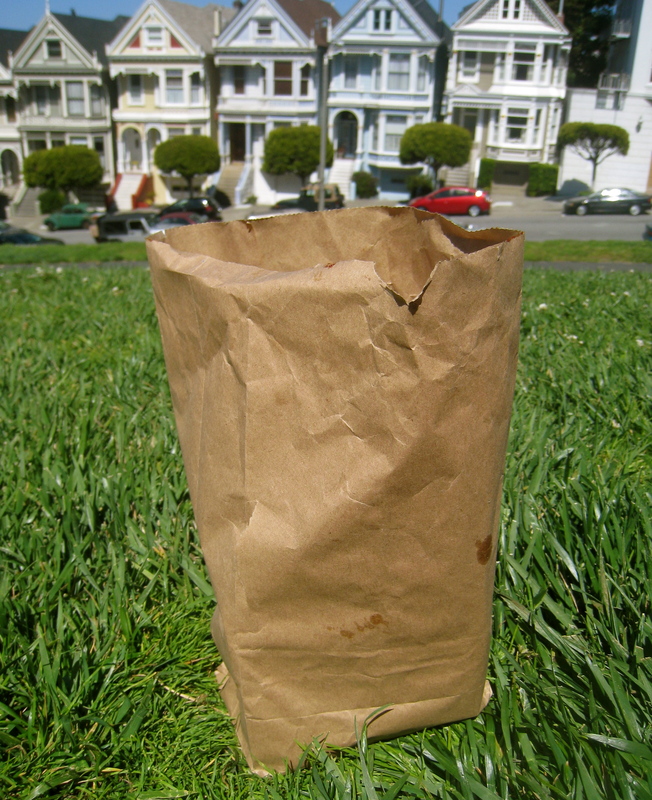 So with two orders of hot wings, two sides and a can of soda for each of us in hand we headed out to Alamo Square Park to enjoy our meal – cause it was just too nice outside not to. All that glory in one little bag. How do they do it? After settling on the grass we opened up that little brown bag to dig in. (Granted I sneaked a peak while in the shop to get a few pics…I just was so excited). For $2 each, I definitely wasn’t offended by the portions. 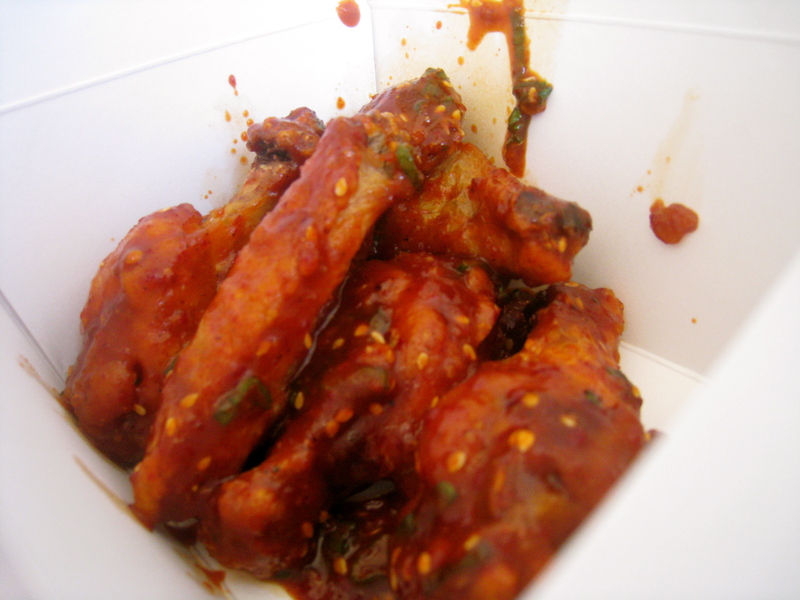 I wanted these Angry Korean wings all over me. That’s the only way to eat hot wings, don’t you know? When Matt first opened the box I was a little confused…aren’t Jerk wings supposed to be like red or brown. We started thinking we had gotten the wrong order, that perhaps this was the Herb wings instead. 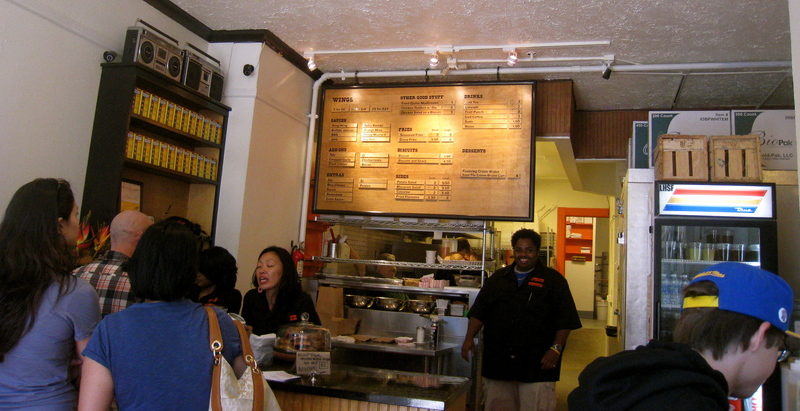 I called them the next day and the woman on the phone explained that the Herb and Jerk were one in the same. “The sauce is Jerk inspired but is really more like an Aioile ” she explained. O.K. then it all made sense. She also let me in on a little secret, the Jerk wings with bacon bits on top was pure heaven. Seriously, I’m down. I started on an Angry Korean wing and oh my sweet Jesus, it was so good. 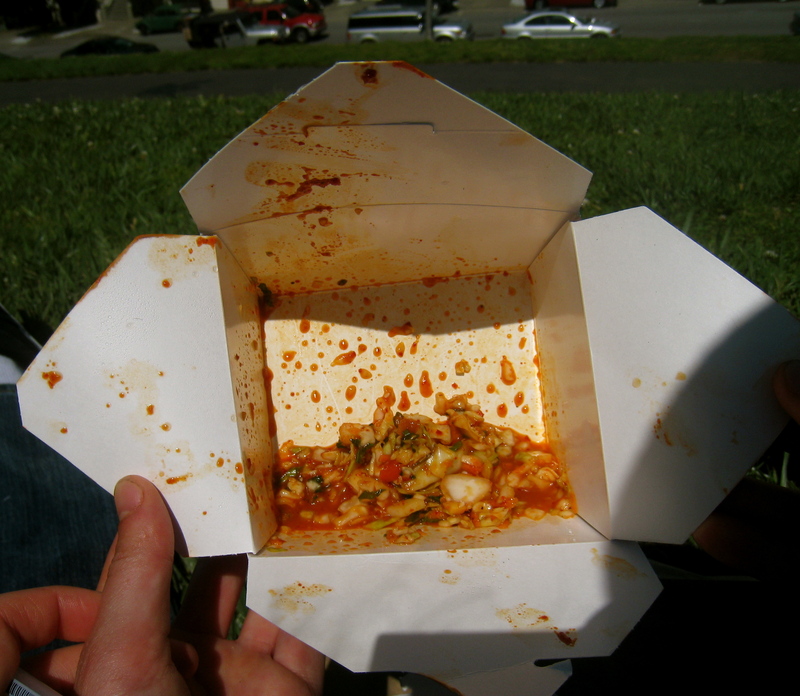 It was spicy, no doubt, but there was a rich component to the sauce like peanut oil that gave the flavor a full body of heat and then a mellow finish and in a way reminded me of Kimchi. Sesame seeds and thin slices of chopped green onion were the perfect touch. I was giddy and smiling like a lunatic and holding fast to the wing in my hands. Oh and my order was only supposed to have 5 wings in it, but their were 6 in there. Best gift ever? Duh. We switched boxes and I started on the Jerk wings. The flavors of scallons, herbs, garlic, and Habanero pepper all came cascading into my mouth on a river of smooth creamy sauce. I liked the Korean sauce more and Matt had really looked reluctant handing me the Jerk chicken after he tried it, so we decided to switch back. Next up where the side dishes. The macaroni was your usual mac salad with a mayo based sauce with no real kick, a nice compliment to the wings but nothing that I haven’t seen before. I did enjoy the addition of hard boiled egg pieces and slivers of carrot, they were an unexpected surprise. When we had finished the Jerk wings we scooped some of the mac into the leftover sauce and WOW, that was a bomb side dish. Same goes for the coleslaw, the ingredients were diced rather than chopped and it had a vinegar based sauce which I gotta tell ya, I’m not the biggest fan of. But that’s just me, I like my slaw sliced thin and dressed in creamy sauce. 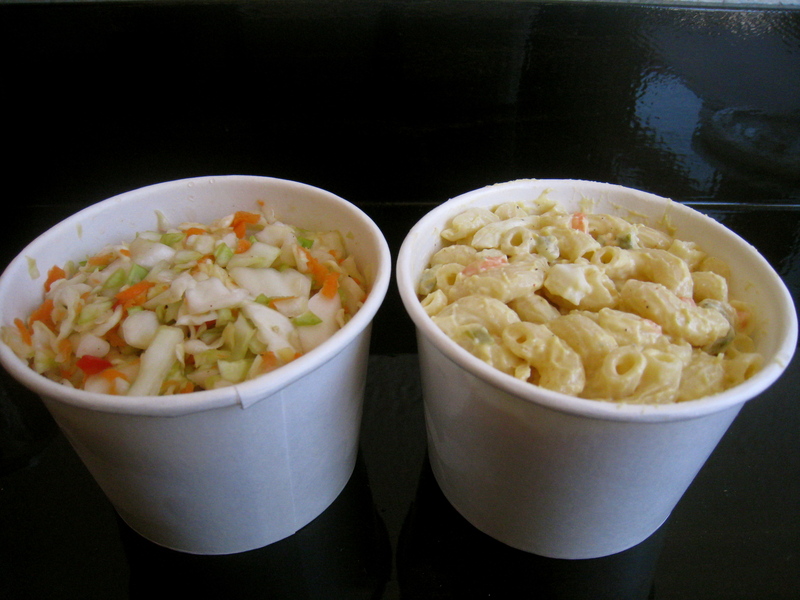 We decided to do another little experiment and added some slaw to the left over Angry Korean sauce – same reaction as for the Jerk Mac. Hot damn, it was wonderful. Cool and crunchy with a heat from the wing sauce that followed through with the vinegar. It seriously was spicier on the slaw than the wings and I was into it. But it did cause me to chug down the rest of my root beer to quell the small fire in my mouth. Not complaining. I would buy that on the daily. After eatin’ everything I was stuffed and content and a little messy. But hey, isn’t that how you are supposed to feel after wings? Overall, I think Wing Wings has some of the best wings I have ever tried with sauces that you just don’t find on store shelves. Their sides leave a little to the imagination but hey that’s not what are gonna be known for. 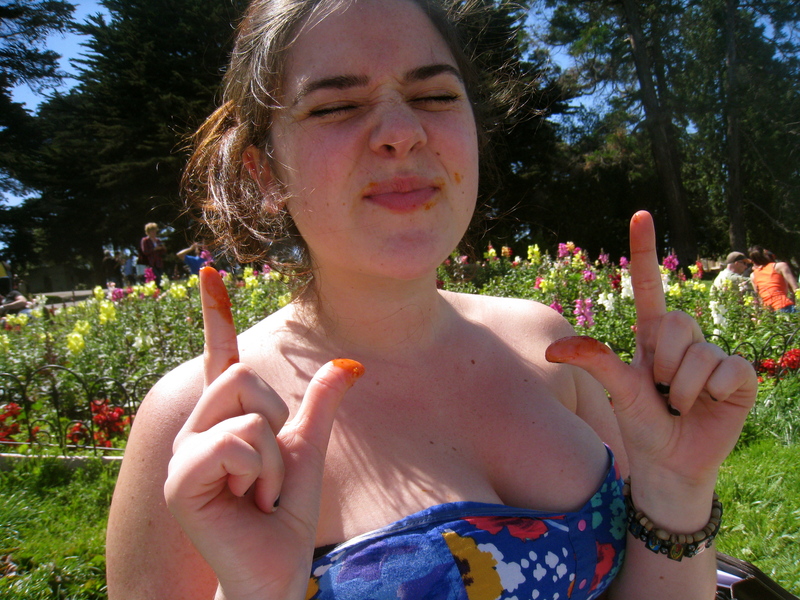 I’m just looking forward to the next sunny day I have off from work so I can go smother myself in sauce once again. This entry was posted in Uncategorized and tagged chicken, coleslaw, Korean, macaroni, new restaurant, Old Bay, san francisco, sauce, Wing Wings by kristinakerley. Bookmark the permalink.